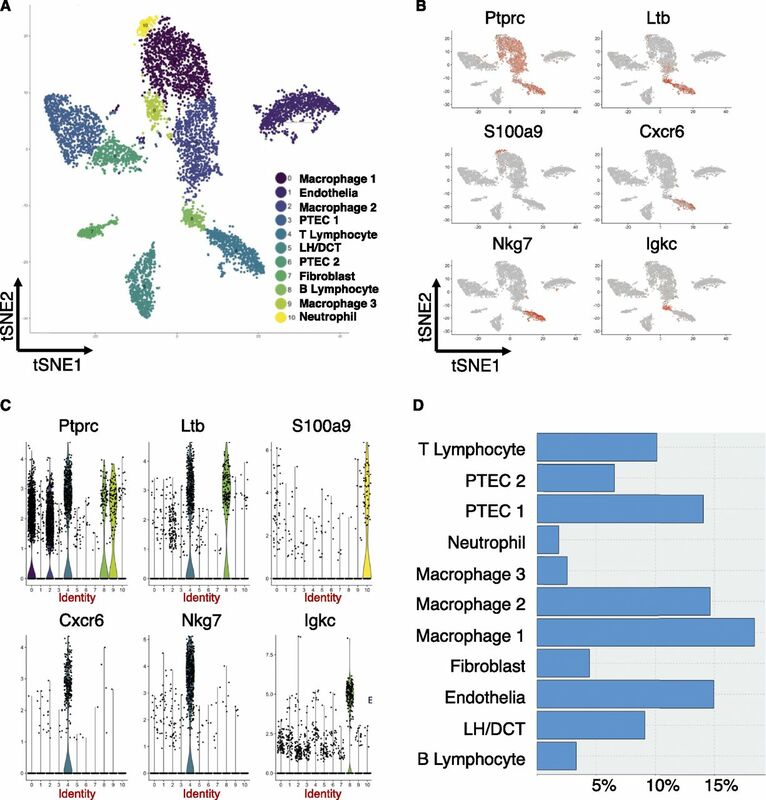 As a group characterizing renal injuries using a similar single-cell, high-throughput, droplet-based platform, we are struck by the differences in cell classification between those described by Wu et al. using single-nucleus sequencing and those seen in our own single-cell sequencing of similar kidneys after unilateral ureteric obstruction (UUO). In contrast to the authors, we detect multiple leukocytes in our samples and identify clusters of distinct subsets of mononuclear phagocytes (35%), neutrophils (1.8%), B lymphocytes (3.3%), and T lymphocytes (10%) from a library of 6213 transcriptomes (Figure 1). This correlates well with existing histologic studies and FACS analysis of digested UUO kidneys showing nearly 40% of renal cells are CD45-positive leukocytes3–5 and is in contrast to a single, small macrophage cluster found on the single-nucleus analysis. Several groups have reported the importance of both T and B lymphocytes in the pathogenesis of UUO, yet single-nuclear RNA sequencing seems not to identify such cells, with representative lymphocyte marker genes suggested by Park et al. instead expressed in sparse cells scattered across multiple clusters in the single-nucleus dataset. It is probable that differing technologies may introduce a cell-specific bias into the library preparation. Single-nucleus sequencing appears to bring improved identification of glomerular cell types. Single-cell sequencing may be more biased toward leukocytes, to the detriment of those glomerular cells. The advantages of single-nucleus sequencing are important and include the reduction of stress-response gene signatures and the ability to sequence historical frozen samples. However, we wonder if current protocols lack the ability to characterize the full spectrum of leukocytes present within the kidney. We propose that complimentary roles exist for both single-cell and single-nucleus sequencing, and researchers may wish to consider the cell-type bias in any workflow, and their own cell of interest, when designing sequencing experiments. Work in the Ferenbach laboratory is funded by the Wellcome Trust and Kidney Research UK.